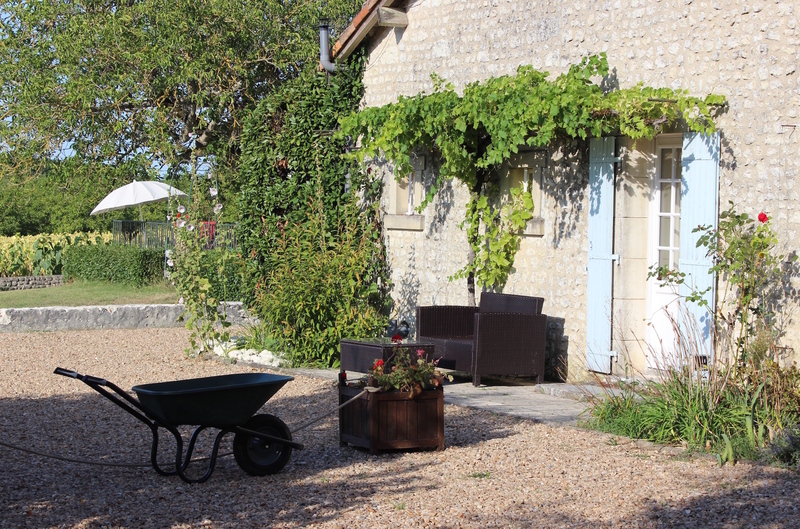 The spacious Pommier is full of charm and character and comfortably sleeps 6 people*. It was newly renovated for the 2016 season, and the bedrooms/beds allow flexibility so that the cottage is appropriate for both couples and for friends holidaying together. It is attached to - but completely separate and private from – the owners’ accommodation. There are three large and well-furnished bedrooms (one on the ground floor), two shower rooms (one is ensuite, the other is on the ground floor), and there is a beamed open-plan sitting/dining room/kitchen (approx. 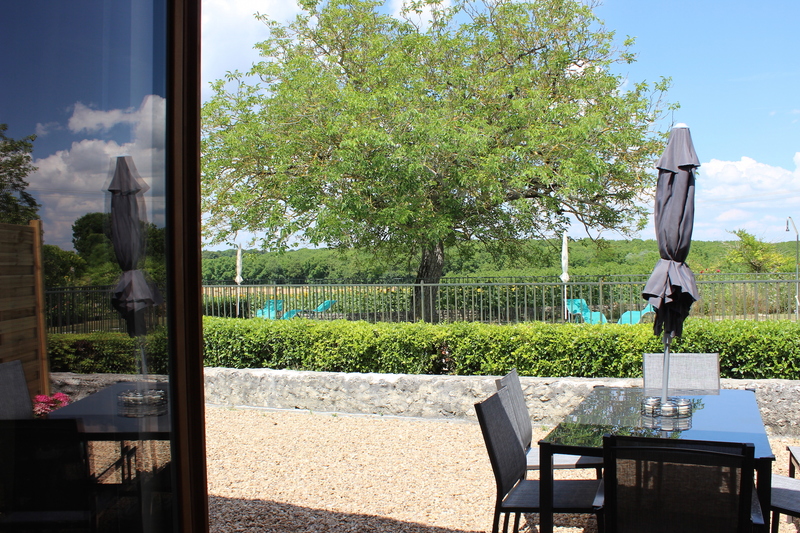 45 sq.m) which overlooks a private furnished terrace, the swimming pool (4m x 11m) and the surrounding countryside. 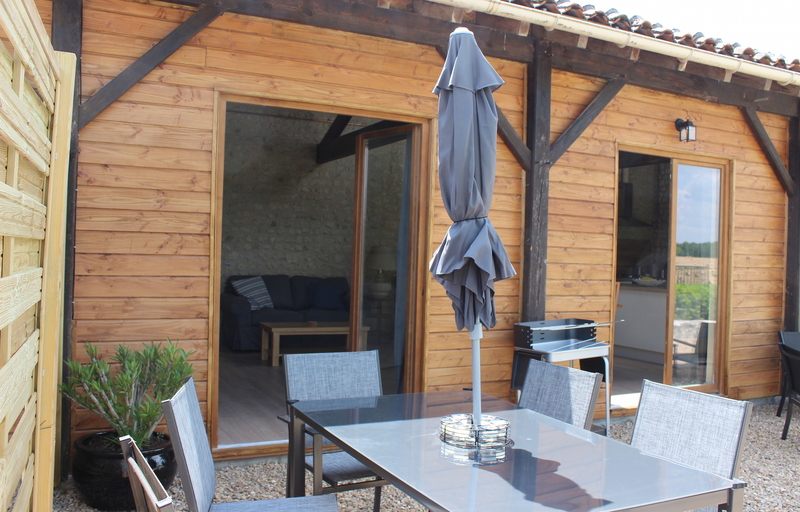 There is also a separate terrace leading from the ground floor bedroom and the gite is heated throughout, for year round holidays. Floors have tiles or laminate and there is free internet available. There are plenty of DVDs and novels to borrow while holidaying here in the Charente. * We offer special rates for couples in September/October - see "Rates" for further details. The terrace leads into an open plan main room ( approx. 9m x 5m) which has a modern, fully equipped kitchen, and separate areas for comfortable dining (the table seats 6) and for relaxing. It is a wonderful space for preparing meals or unwinding after a day’s sightseeing or walking. It has a high, beamed ceiling and there are three sets of French doors opening onto the terrace with BBQ and table/chairs. The kitchen is fully equipped with new appliances - oven, hob, fridge freezer, washing machine and dishwasher and has plenty of cutlery, crockery and ovenware. The lounge area has comfortable seating, coffee table, TV/DVD player and hifi, plus small ipod dock. Sit in the garden and enjoy a relaxing lunch sheltered from the midday heat or a leisurely supper, watching the sun go down. There is a good-sized and newly fitted ground floor shower room with large modern shower, wc and country style vanity basin. "Ouessant" the ground floor bedroom (25 sq.m) is a characterful room with an ancient (decorative only!) Charentais “potager” (a type of slow cooker), stone "evier", beamed ceiling, original terre cuite floor tiling, stone fireplace, a large south facing window, and an external west-facing door. It leads onto a small terrace with sitting area, for watching the glorious sunsets. The room sleeps two - there is a double and a single bed (dressed as a day-bed) - and can be made up as a twin or as a double. There is a wardrobe, chest of drawers and two bedside tables plus small table and comfortable chairs. On the first floor there are two bedrooms (one with ensuite shower/basin) and a separate wc. Bedroom two ("Rambouillet" 16 sq.m) faces south, looking out over gardens; it has beams, a newly refurbished ensuite shower/basin, a double bed, wardrobe, chest of drawers and bedside tables. Bedroom three ("Jacob" 24 sq.m) is a large room with high ceiling and beams and which also faces south with views over the gardens. It sleeps two - there is a double bed and a comfortable metal action sofa bed - and can be made up as a twin or as a double. It is furnished with a triple wardrobe, chest of drawers, bedside tables and upright table and chairs; the sofa is close to the window and is a lovely place to relax. All heating, bedlinen and towels (including pool towels) are provided. The gite will be clean and ready for your arrival and we ask that you leave it clean and tidy when you leave. Dogs are welcome - but please read through the information "A Dog's Holiday..." which appears under the Bookings/ Enquiries tab.